Of course a helmet is important when it comes to high speed downhill rides. Protectors and pads for your elbows, knees, and back are also important parts of your personal equipment and keep you from serious injuries. In the past years, much has been achieved in terms of protective cycling clothing. Manufacturers like POC, Sweet Protection, Endura, and ION use comfortable, shock-absorbing materials these days. These materials originate from the motorbike industry, which means they are extremely robust. First you should ask yourself whether elbow and/or knee pads are sufficient for your purposes or if you need further protection. Pads are lighter and provide more freedom of movement. They protect you from abrasions, scratches, and minor injuries and distribute the energy of the impact over a wider surface, which reduces the risk of injury. 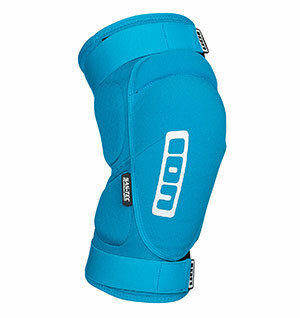 The purpose of protectors is to absorb extreme shocks and protect your joints from irreparable damage. A robust protector constitutes the next protection level. There are several factors that determine whether a cycling protector will protect the respective body part reliably. It must not slip during a crash. Otherwise, knees, elbows, or spine are likely to suffer injuries. Therefore, protectors must fit perfectly at all times. Only if the MTB protection fits tightly and remain in position reliably, will the padding elements protect your body. Elastic materials with hook-and-loop fasteners, siliconized anti-slip reinforcements, or neoprene cuffs guarantee secure fit. As a result, you will enjoy full freedom of movement without being disturbed by the protector while riding your mountain bike. Protector vests or protector jackets protect your upper body like a full face helmet protects your face during downhill rides. These vests and jackets come with an integrated back protector. 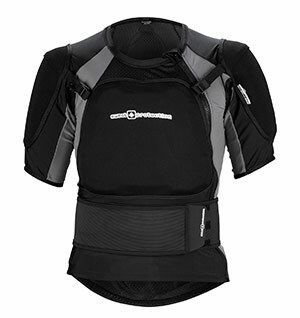 This protector minimizes the risk of spinal injuries. At the same time, additional paddings make sure that your collarbones and other parts of your body stay safe. Cycling vests with protectors provide reliable fit and consist of functional materials. Therefore, the vest feels comfortable even on demanding trails. Removable protector elements can be cleaned easily or replaced after severe shocks.